A warm gift for your favorite scholar. Perfect gift for graduates of any age. 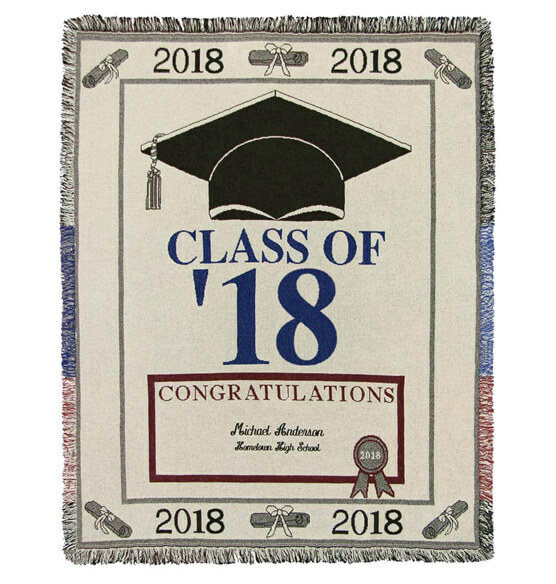 Personalized 2018 graduation afghan is embroidered with "Congratulations", followed by the graduate's name (first line) and school (second line). Please specify graduate’s name and school, up to 3 lines, 24 letters and spaces each. Custom blanket is made from 100% cotton. 60" long x 50" wide. Made in the USA. Allow 3-4 weeks. No express shipping.